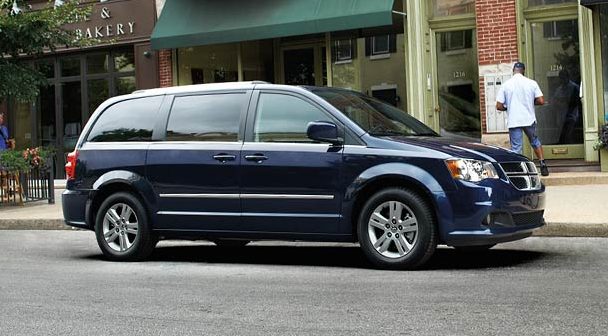 At Davis Dodge, our selection of Grand Caravans is sure to get you excited! 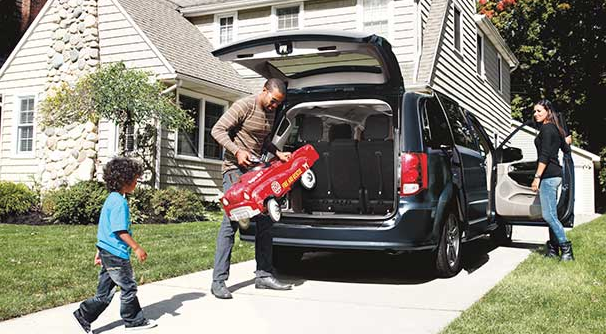 The Dodge Grand Caravan is Canada's Best-Selling Minivan for over 30 years and there's no questioning this van's unbeatable versatility, advanced safety features and family-oriented design. With industry-exclusive super stow'n'go seating, 1633 kg worth of towing and stacked with entertainment, you'll love your Grand Caravan from Fort Macleod. Talk with one of our representatives today, and learn why vehicle buyers come from Calgary, Lethbridge and Claresholm for a shopping experience at Davis Dodge. The 2nd-row Super Stow 'n Go® seats are standard on SXT, SXT Plus, Blacktop, SXT Premium Plus, Crew, Crew Plus and R/T models. The innovative one-touch fold-down operation offers premium comfort and convenience. Pull the handle and the headrest folds flat, the backrest flips forward and the rear seat anchor unhinges – to stow the seats in seconds. Access to the 3rd row is easy thanks to the 2nd-row Super Stow 'n Go seats, which provide 101 mm (4 in) of movement forward and backward. 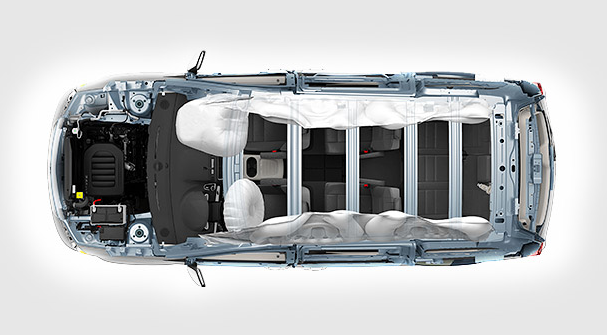 The standard 3rd-row Stow 'n Go® seats, with Class-Exclusive tailgate seating, fold and stow in below-the-floor storage bins, significantly increasing cargo-carrying flexibility – so there's no need to remove seats for maximum cargo space. 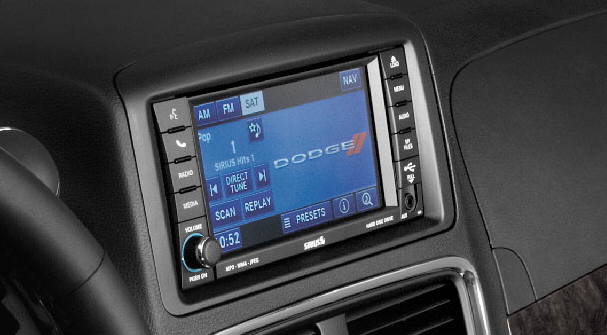 The available Super Console is one more feature that sets the Dodge Grand Caravan apart from the competition. It offers the convenience of organization with an upscale, refined appearance. 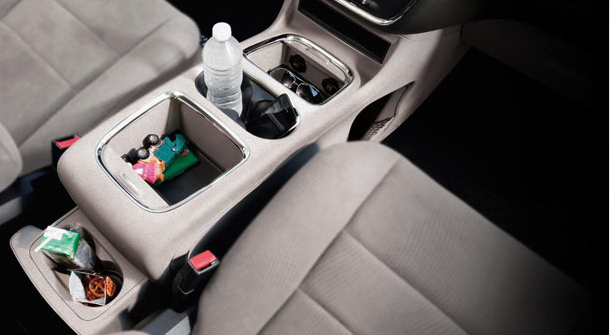 It features a driver-accessible storage compartment and a large storage drawer. Both can be accessed from the 1st and 2nd rows, and each of these areas can also be covered with stylish tambour doors. Additionally, there are 2 power outlets within easy reach of the driver. The console contains 2 front cup holders and 2 rear-passenger cup holders. Power 2nd-row windows and power 3rd-row quarter vented windows are standard on SE Plus, SXT Plus, Blacktop, SXT Premium Plus, Crew, Crew Plus and R/T. Retractable sunshades are also available for both 2nd- and 3rd-row windows. Convenience can be thoughtful and simple. 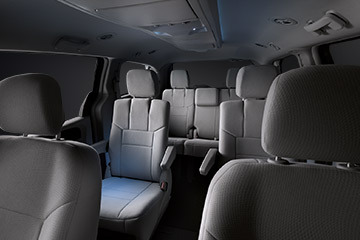 Inside the Grand Caravan, create your ideal driving position with an adjustable driver's seat with available power and the tilt/telescoping leather-wrapped steering wheel with its available heated option. Storage for smaller items is plentiful with the dual glove boxes, and customizable comfort for all your passengers is well in hand with the available tri-zone temperature control. 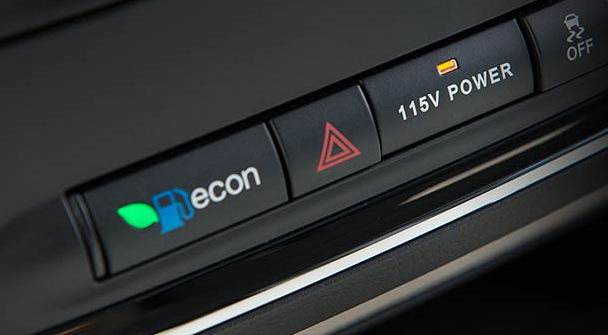 See vital vehicle information in one display with the available Electronic Vehicle Information Centre (EVIC). Reconfigure the information as needed, to get details like outside temperature, compass direction, audio information and available navigation. Experience the soft glow of Sapphire Blue light with the available interior ambient lighting. Available personal, targeted LED lights allow passengers to read, write or play at night without distracting the driver. With just the touch of a button, you can open the power liftgate and dual sliding doors for exceptionally smart convenience. This feature comes standard on Crew Plus and R/T, and is available on SXT Plus, Blacktop, SXT Premium Plus and Crew. 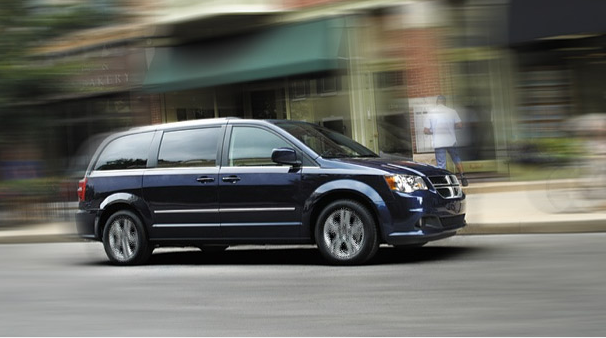 The Grand Caravan's ready-for-anything versatility is personified in its bold look. It begins with the signature chrome crosshair grille, front fascia and quad headlamps. As you move rearward, the refined design is completed with a spoiler, liftgate assembly and rear fascia with LED taillamps. 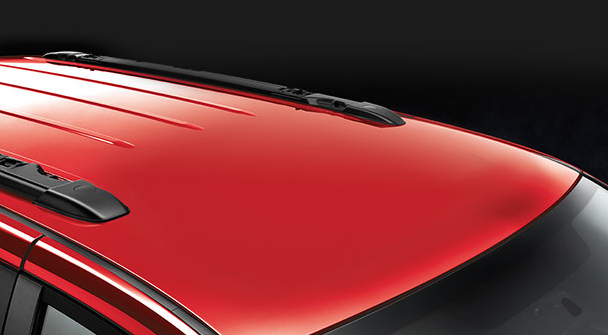 The ingenious Stow 'n Place® roof rack system enables you to stow the crossbars in the side rails when not in use for lower aerodynamic drag, wind noise and improved overall fuel efficiency. Snap them back into place when you need them. The standard folding sideview mirrors help take the bite out of winter with a heating element that can melt accumulated snow and ice. 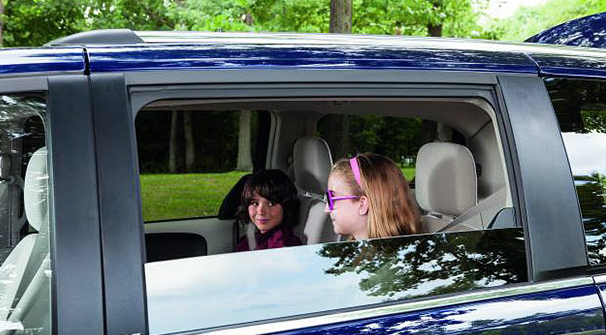 Enjoy the convenience of features like available tinted sunscreen glass and a standard rear window defroster. 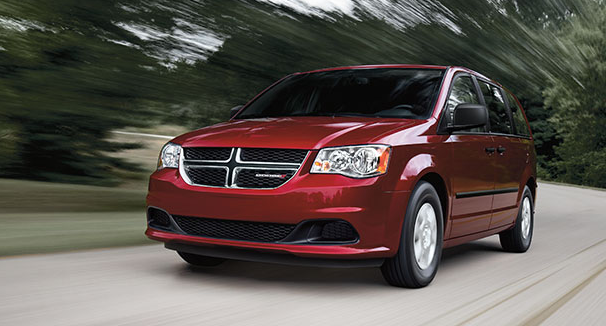 The Dodge Grand Caravan provides exceptional fuel economy as efficient as 9.4 L/100 km (30 mpg) highway. 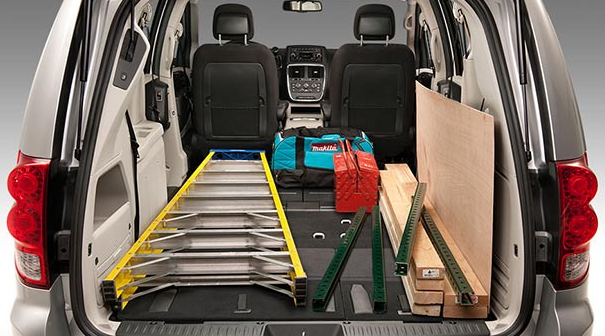 To create a smooth and responsive ride, the Grand Caravan features sturdy front and rear springs and includes larger-diameter rear shocks. A high-rate rear torsion beam axle and track bar bushings improve body control for a more solid and confident driving feel. 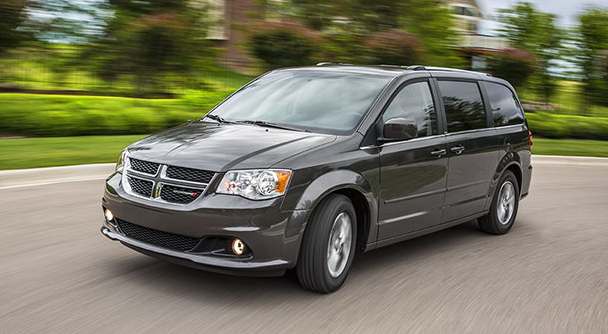 The Grand Caravan's outstanding responsiveness is due to its quick-ratio steering system. It delivers precise steering and greater road feel. 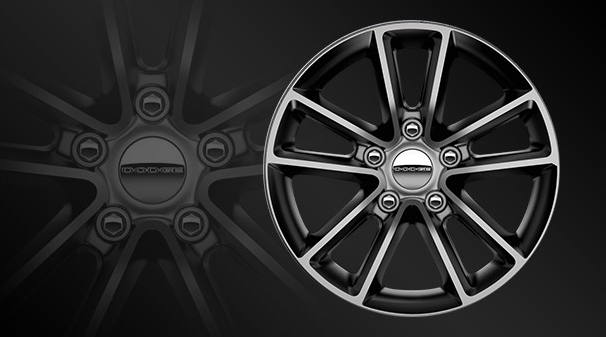 Equally, the chassis architecture delivers excellent handling with maximum grip and control. The Grand Caravan's driver-selectable fuel economizer mode provides the ability to maximize fuel efficiency with the push of a button. 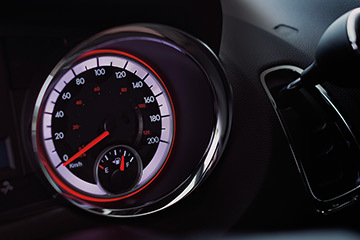 When activated, it helps save fuel by intelligently altering powertrain characteristics including engine idle speed and transmission shift schedule. This advanced system is available to keep you entertained, connected and informed. There are 28 gigabytes of available hard drive space for storing photos, playlists and digital music. 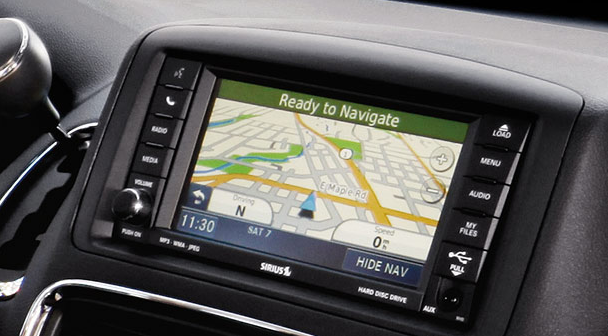 It also includes an AM/FM stereo radio and CD/DVD player, 6.5-inch touchscreen display, MP3/WMA capability, an auxiliary input jack and USB port to connect portable music devices, SiriusXM satellite radio, ParkView® Rear Back-Up Camera and Garmin® Navigation. This Class-Exclusive feature provides two 9-inch flip-down screens that are easy to operate and play independently, so two media sources can be viewed simultaneously. Dual media jacks and a 115-volt outlet allow for a game system, video camera or audio device connection. Plus, with two sets of flat-storing wireless headphones, a combination of video and gaming can be enjoyed on both screens. The kids can easily use the remote control or simply insert a Blu-ray®/DVD disc for automatic play. SiriusXM satellite radio is factory-installed and comes with a one-year subscription. Standard on Crew Plus and R/T, and available on every other model, it offers up to 120 channels, including commercial-free music and the best in sports, talk, children's programming and news. Set up alerts for your favourite artists, songs and sports teams, while the replay feature lets you go back and hear it all over again. 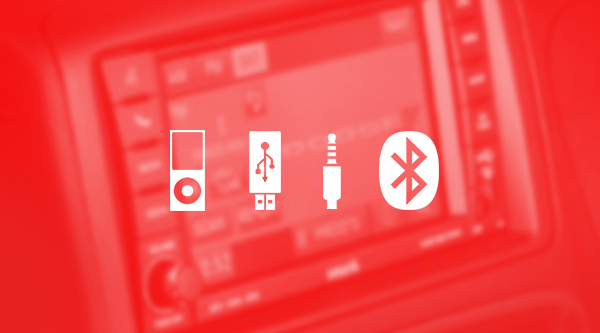 Use Bluetooth® streaming audio to wirelessly connect your compatible smartphone or music device to the sound system. Control your device with the radio controls and steering wheel-mounted switches to display artist/music choices on the radio. The Safety Sphere Group, available on Grand Caravan Crew, Crew Plus and R/T, combines advanced safety and technology features into one complete package. 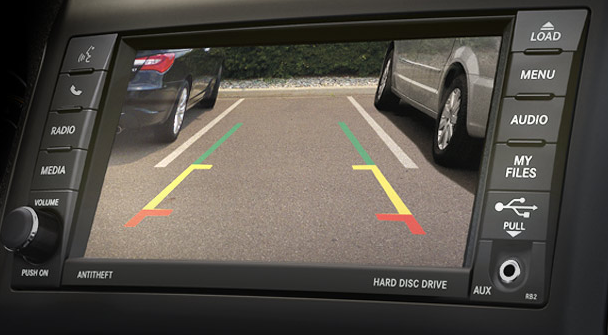 Park-Sense® Rear Park Assist helps the driver determine if an obstacle is in the rear path of their vehicle when manoeuvering in tight spaces at parking speeds. 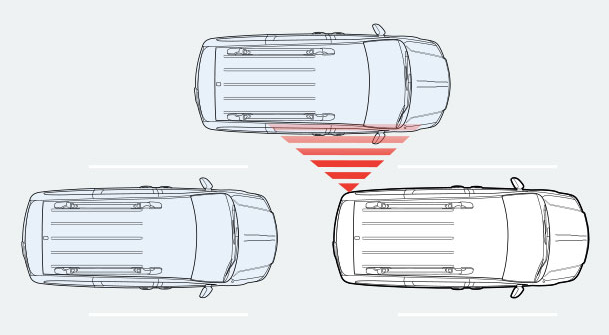 When driving forward, the available Blind-Spot Monitoring system continually monitors the vehicle's side blind zones using dual radar sensors. 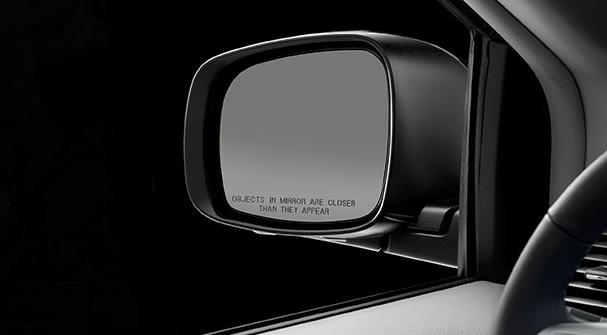 When an object is detected, an indicator illuminates in the appropriate sideview mirror, with an optional audible notification. 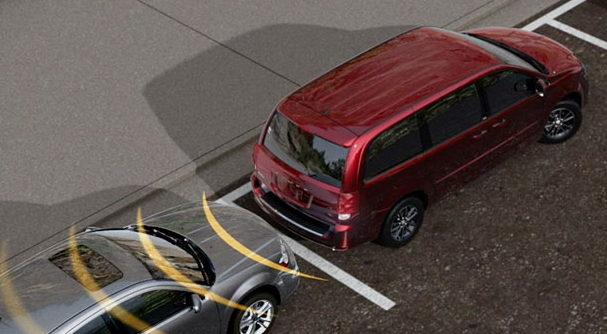 In Reverse, Rear Cross-Path Detection automatically monitors for objects and vehicles in perpendicular relationships to the vehicle and is ideal when backing out of tight parking spaces or alleys. 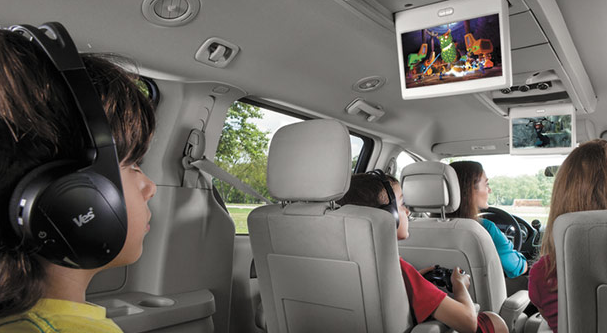 The available ParkView® Rear Back-Up Camera in the Grand Caravan's tailgate offers a clear rear view and activates automatically when the vehicle is shifted into Reverse. The camera image is conveniently displayed on the touchscreen and includes grid lines to show the proximity of your vehicle to any visible obstacles. The advanced multistage driver and front passenger air bags inflate with a force appropriate to the severity of the impact, while front-seat-mounted side air bags provide even more protection. The driver's knee blocker air bag helps reduce driver injury and properly positions the occupant during an impact. The side-curtain air bags blanket outboard positions in all 3 rows of seating. 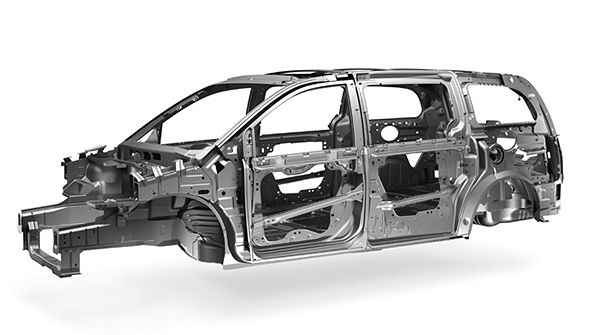 The Grand Caravan is formed by welding high-strength steel sheet metal stampings into a single, lightweight structure, resulting in a stiff body structure and high torsional rigidity. For you, it means better impact protection, smoother ride and handling characteristics, and less interior noise. 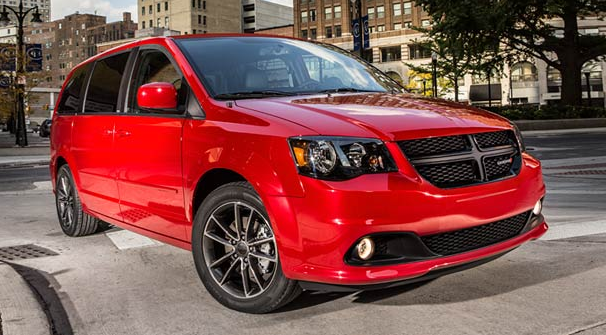 Take a look at the Grand Caravan today!